The Egyptian economy has been in turmoil since early 2011, and the gradual rise in economic freedom observed in recent years has come to a halt. 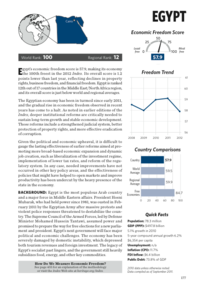 Egypt’s economic freedom score is 57.9, making its economy the 100th freest in the 2012 Index. Its overall score is 1.2 points lower than last year, reflecting declines in property rights, business freedom, and financial freedom. Egypt is ranked 12th out of 17 countries in the Middle East/North Africa region, and its overall score is just below world and regional averages. The Egyptian economy has been in turmoil since early 2011, and the gradual rise in economic freedom observed in recent years has come to a halt. As noted in earlier editions of the Index, deeper institutional reforms are critically needed to sustain long-term growth and stable economic development. Those reforms include a strengthened judicial system, better protection of property rights, and more effective eradication of corruption. Given the political and economic upheaval, it is difficult to gauge the lasting effectiveness of earlier reforms aimed at promoting morebroad-based economic expansion and dynamic job creation, such as liberalization of the investment regime, implementation of lower tax rates, and reform of the regulatory system. In any case, needed improvements have not occurred in other key policy areas, and the effectiveness of policies that might have helped to open markets and improve productivity has been undercut by the heavy presence of the state in the economy. For more information on the background, the criteria of rankings and the economic freedom trend, download the paper. All whitepapers are available to you and free of charge. This whitepapers is provided by Heritage.